For the month of March, Samantha Balderas – Customer Communications Specialist— gives us some insight on the best way to plan your trip with DCTA! Can I Use Google Maps to Plan My Trip? On your desktop or mobile phone, enter your desired destination in the Google Maps search bar or tap the destination on the map. Click the “Directions” button then choose the transit icon, which will look like a train. Google Maps will map out your trip and provide travel options based upon active bus routes or A-train route at the time you selected. You will also see the cost of transportation, delay information, as well as the travel times. If travelling at a later date, click the “Leave now” option and select “Depart at.” Enter the time and date you’d like to travel. Google Maps will show you travel times and routes that best fit your needs. Can I Use DCTA’s Transit Tracker to Plan My Trip? The Transit Tracker is another great way to plan your trip. The Transit App is an interactive, FREE mobile application that show DCTA’s system routes such as A-train, Denton and Lewisville Connect Bus, University of North Texas and North Central Texas College Campus Shuttles and Highland Village Connect Shuttle. You can also track our vehicles in real time! Select the DCTA bus or train route number on the screen. This will map out the bus or train route needed to get to your destination. It will also estimate how long it will take to walk to the bus stop or train station. The Transit App will also list out all of the bus stops or train stops along your route. Tap “Go” and you’re on your way! For information about our transit tracker, visit our blog post. Can I Visit the Downtown Denton Transit Center (DDTC) to Plan My Trip? Of course! 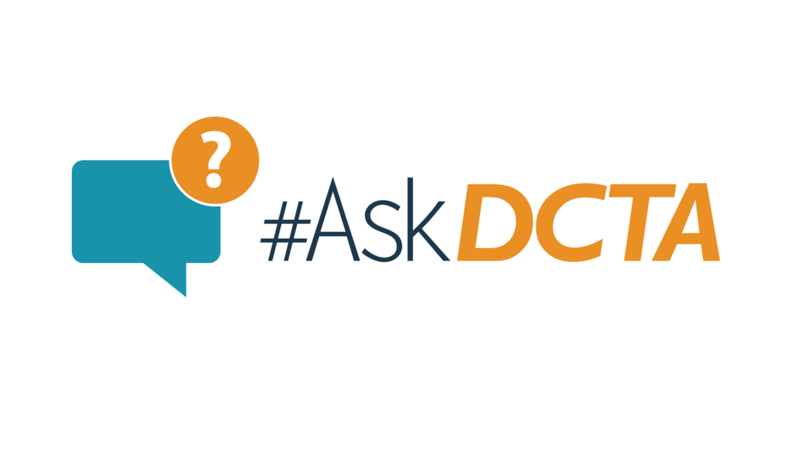 Quick insider tip – the DDTC is one of the best resources for planning your trip and getting all of your questions answered. You can find our fixed route and A-train route guides in the lobby as well as other informative brochures for your trip. If you need assistance with planning a trip, ask one of our friendly customer service representatives at the ticket window! Have your destination’s physical address ready for the CSR to look up. Make sure to ask the CSR to print out the trip plan for you. They would be happy to do so! Tickets can be purchased at the DDTC or at any train station. PLEASE NOTE: Not all fare types can be purchased at the DDTC. Monday through Friday from 5 a.m. to 7 p.m.
Saturdays from 8 a.m. to 4 p.m. If you can’t make it to the DDTC then utilize our call center! The most common question our CSRs receive is how to get from point A to point B. Make sure to have a starting address and an ending address so our CSRs can pull up the best route for you. How Long Will It Take to Get To My Destination? Some of DCTA’s Connect Bus routes run every 15 minutes during peak hours, others run every 30 minutes. Visit RideDCTA.net to view our A-train and Connect bus schedules. We hope Samantha helped answer all of your questions about how to plan a trip with DCTA!